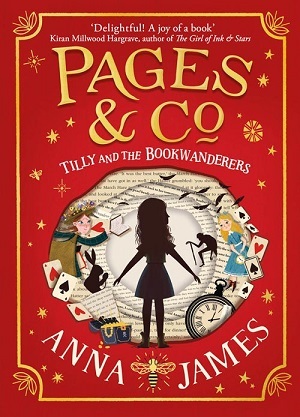 Pages & Co: Tilly and the Bookwanderers by Anna James is the first in a trilogy that tells the story of eleven-year-old Matilda (Tilly) Pages, who has lived with her grandparents above their bookshop ever since her mother disappeared shortly after Tilly was born. If you’ve ever witnessed a child completely immersed in a book so that they don’t even hear their own name being called, then you’ll understand the type of character Tilly is. She loves books, and with good reason. Her grandparents’ bookshop is an idyll – with nooks and hidden corners, chairs to nestle into, and all the time the permeating aroma of hot chocolate and fresh baking from the café. But there is more magic to the bookshop than great cakes and good books. Before long, Tilly is seeing characters from books come alive inside the shop – at first they speak to just her grandparents, but before long she meets Alice (from Wonderland) and Anne (from Green Gables). And then, to her surprise, she finds she can accompany them back to their own worlds too – and her book wandering adventures begin. The premise of the book is delightful for book lovers – to literally escape into the book, and James is brave here – writing words into Alice’s and Anne’s mouths, even writing a tea party scene from Wonderland, in which Tilly meets the Mad Hatter. James pulls this off with aplomb, capturing the essence of the classic characters in both their speech and their mannerisms. She also executes the rules of her bookwandering world with skill – adeptly laying out for the reader (and Tilly) when it’s possible to enter a book, how to exit, and how the whole system is managed. Tilly discovers that bookwandering doesn’t just happen in her grandparents’ bookshop, Pages & Co, but in many others, and the management of bookwandering happens in the underbelly of The British Library, where she is eventually invited to learn the rules. (A really wonderful scene here, in which Tilly has to learn to bookwander by starting in an early reader, Peter and Jane book, in which nothing happens). The book leaps into even more adventurous territory when Tilly discovers that bookwandering may explain her mother’s disappearance. Real life inspired Pages & Co in several ways (and probably in many other subconscious ways I’m not even aware of). I’ve pulled from people, places, and feelings to try and make the world of the book feel as real as possible, despite the magic going on. There’s one place I literally just stole, but several others inspired some of the locations of the plotlines of the book; here are five that had the biggest impact. Linked to my grandparents house is Masons of Melrose, their local independent bookshop. When we visited we used to walk from their house down the River Tweed to Melrose where we’d visit the bookshop and then walk back to eat and read in front of the fire. This bookshop is also where my Grandad used to choose our Christmas books, and the booksellers there recommended me, via him, to read Northern Lights and Harry Potter when I was 10. I studied Modern and Medieval History at the University of Birmingham and I specialised in the early modern period; the Reformation and Tudor History, especially the history of printing and the impact it had on the period. The university is a beautiful red brick campus and the Great Hall, where I graduated, was one of the buildings I used when I was creating the British Underlibrary. I also spent a lot of time in the library, which has since been updated and modernised, but the old red brick building that was at the centre of the campus is my library, and the one that influenced the Underlibrary (more on that later). I’ve lived in north London for just over three years now and I love it. Hampstead Heath, Alexandra Palace, my local high street full of independent coffee shops – when I started writing Pages & Co the only place I could imagine it, was near where I live. It is entirely impossible it could be, with its four floors and architectural dubiousness, but it’s still where it is in my imagination. It’s also, crucially, near to Kings Cross St Pancras which leads me on to the last real place which inspired me. 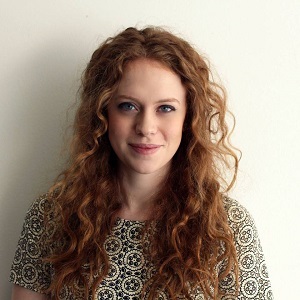 With huge thanks to Anna James for mapping her inspirational geography for MinervaReads. You can buy a copy of Pages & Co here.